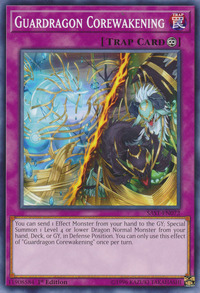 You can send 1 Effect Monster from your hand to the GY; Special Summon 1 Level 4 or lower Dragon Normal Monster from your hand, Deck, or GY, in Defense Position. You can only use this effect of "Guardragon Corewakening" once per turn. Guardragon Justicia and Guardragon Andrake appeared in this card's artwork. This card's event may refer to the energy of Crusadia Draco that has been absorbed into the cocoon at the top (World Legacy Guardragon) and thereby spawn Guardragon Justicia and Guardragon Andrake.